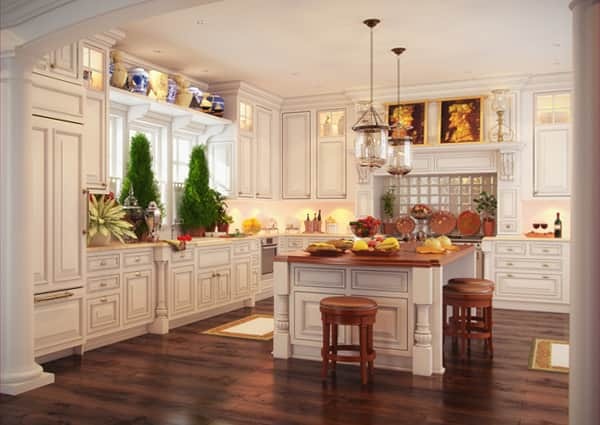 The plan and arrangement of the kitchen is more crucial than most people assume. 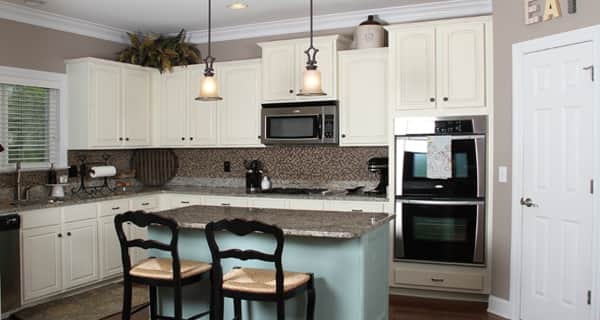 There is a wide array of stylish and convenient kitchen plans to choose from, including corner kitchens. 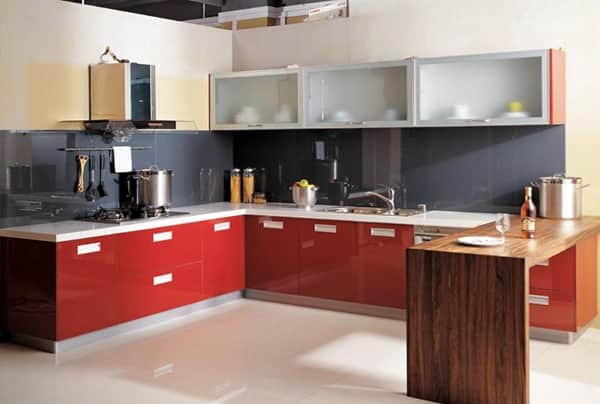 Corner kitchens are easily among the best kitchen designs, owing to their unparalleled comfort, functionality and design. 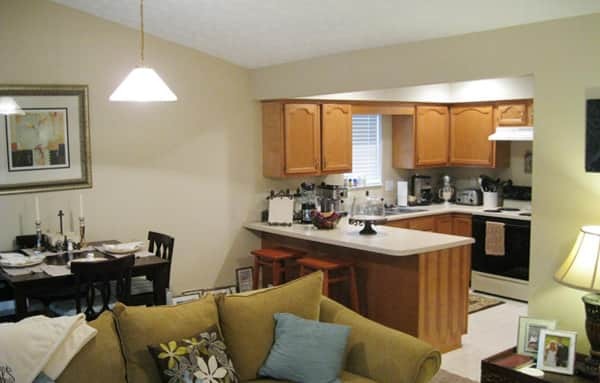 The corner kitchen is the best option for occupants who love to cook. 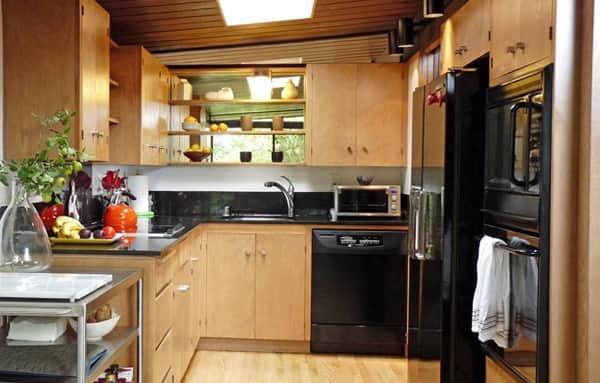 This is because with this arrangement, all cooking equipment is easily accessible. 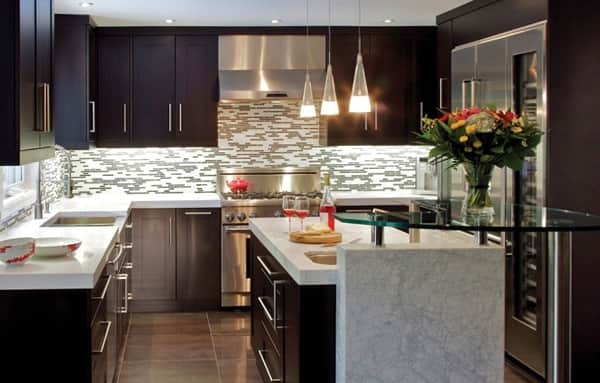 Designers offer a variety of solutions for the interior of the corner kitchen. 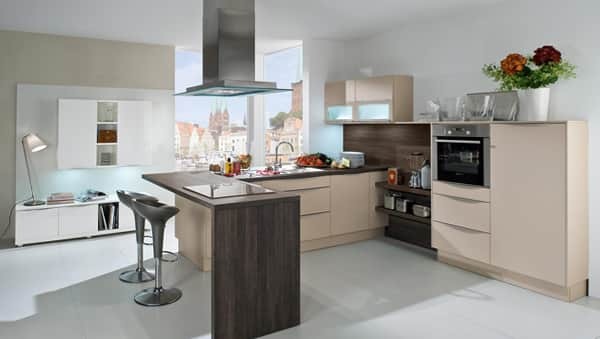 Below is a series of photos showcasing modern corner kitchens, which you can choose from at your discretion. 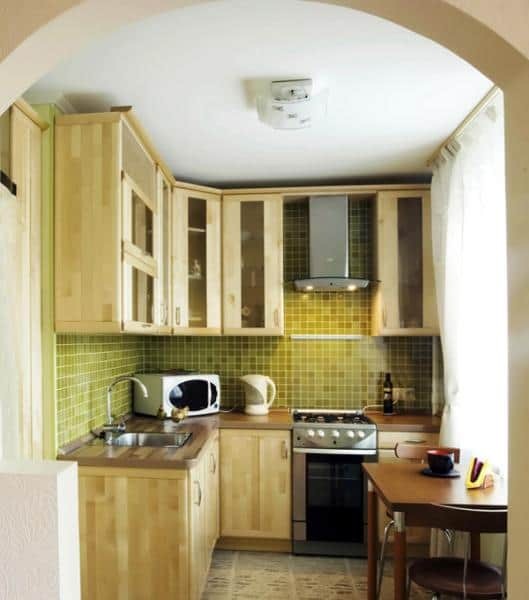 Small corner kitchens in the interiors of small rooms should be not only harmonious, but also practical. 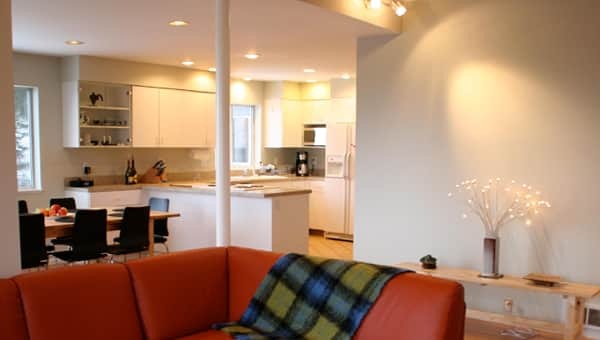 All furniture should be arranged based on the triangle rule. 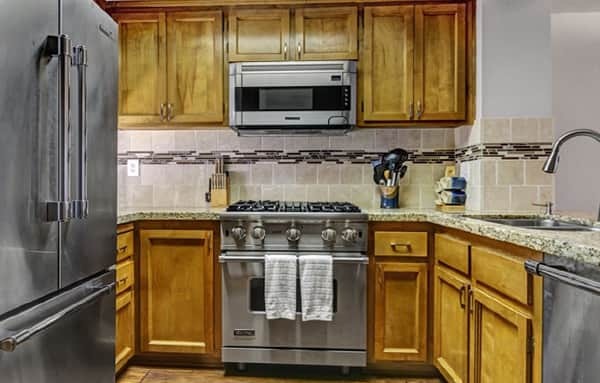 All work areas that form the triangle (refrigerator stove and sink) are most conveniently placed within walking distance of each other, preferably one and a half meters apart from each other. 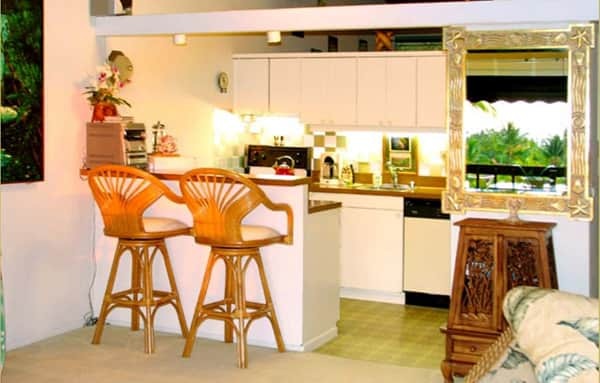 Here are photos depicting several variations of the arrangement of furniture in a small square. 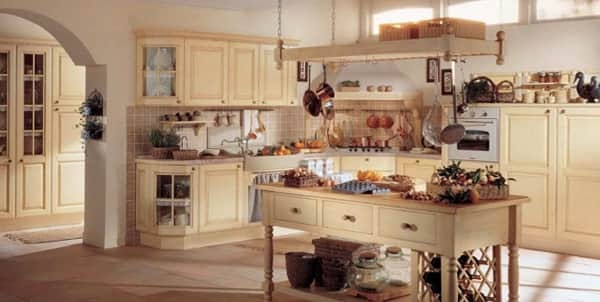 However, it is worth considering that furniture for a small kitchen will have to be made to order, since standard sets are made based on the size of kitchens measuring 65 sqft and more. 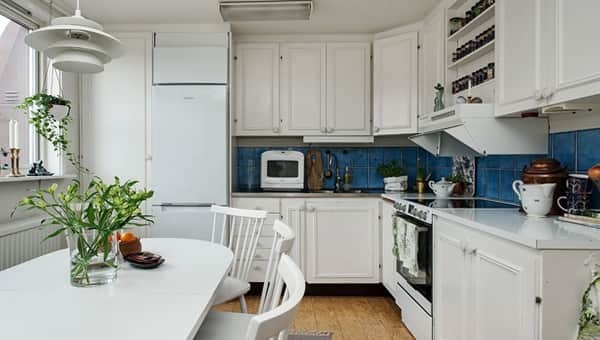 Often, it is advised that owners of tiny kitchens place the refrigerator at the entrance, followed by a small cupboard and sink, then the stove and kitchen table. 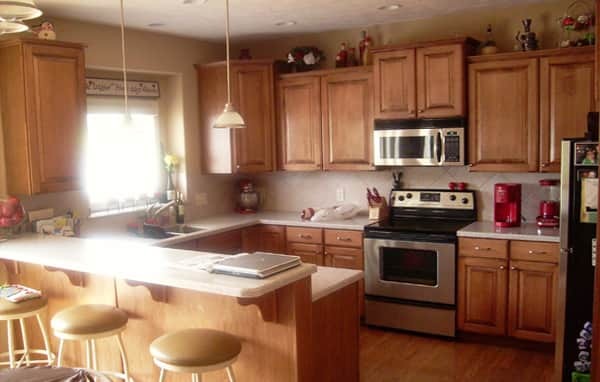 Points to Note When Arranging and Decorating a Kitchen of ​​100 sqft. 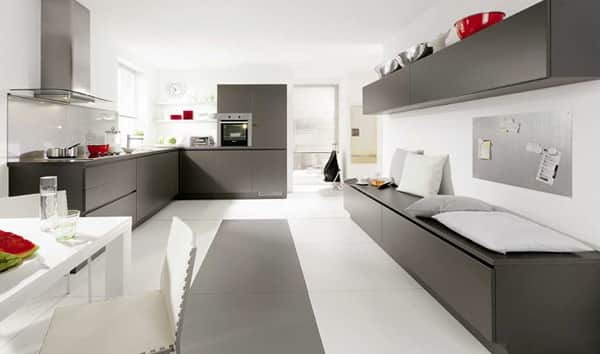 For an area of ​​100 sqft, creating an angular layout is the optimal solution. 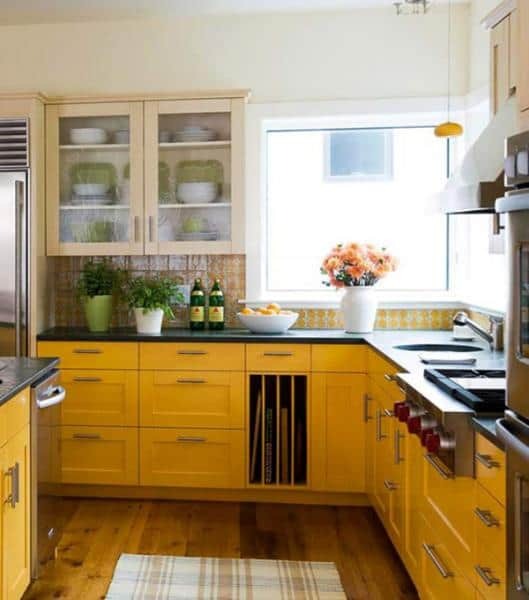 This is because such an arrangement not only allows for rational use of the limited space; it also brings convenience to the user. 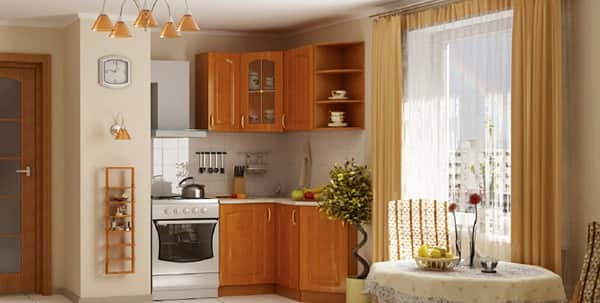 While small corner kitchens are unable to accommodate much furniture and appliances, with wise arrangement, a lot of furniture and equipment can be harmoniously incorporated. 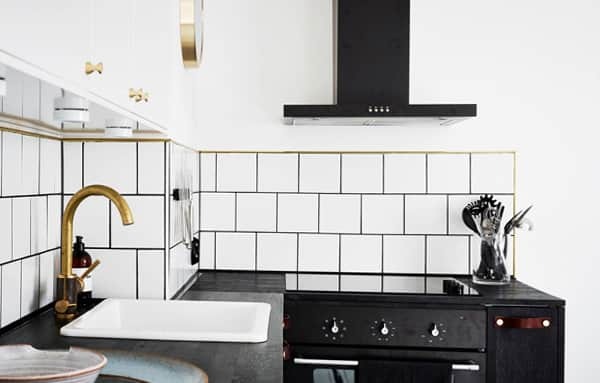 For a corner kitchen measuring nine square meters, appliances and accessories are best placed in the corner of the sink, and on the sides of countertop cabinets, stoves and any other kitchen installations. 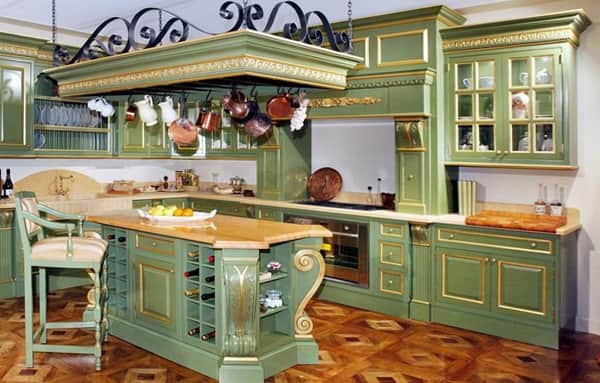 Kitchen furniture can be arranged in a variety of ways. 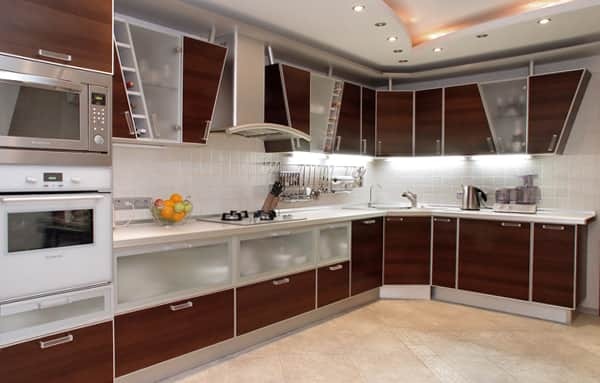 The most original arrangements include: angular, linear, two-row, P and Y-shaped arrangements. 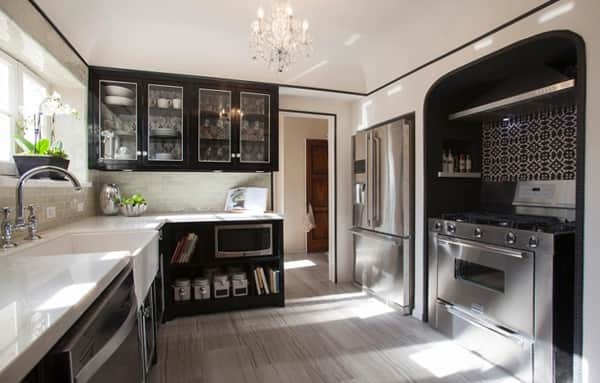 Built-in equipment allows you to free up enough space for a dining area, large enough to accommodate the entire family and even guests. 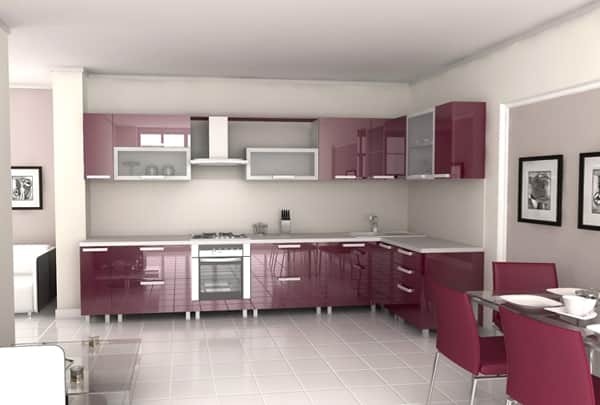 Kitchen sets are mainly made of furniture modules that can be modified by the buyer at their own discretion. 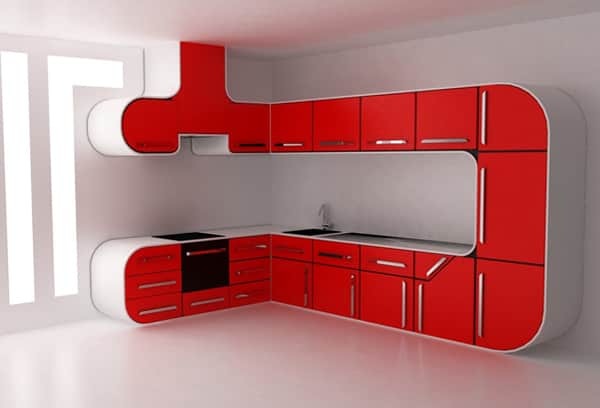 Modular elements are further designed in a way that the entire space is maximally used. 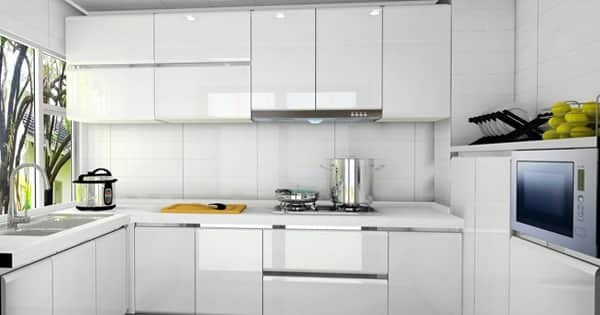 The use of angular modules allows the placement of extra appliances and items in the open space of the kitchen. 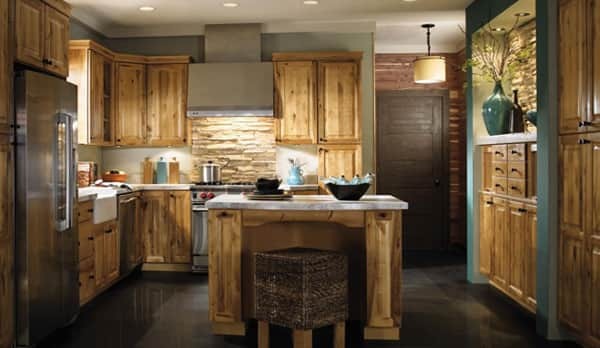 Having a kitchen bar counter, furniture made from natural materials and use of natural colors results in a classic and timeless look, like in the photo below. 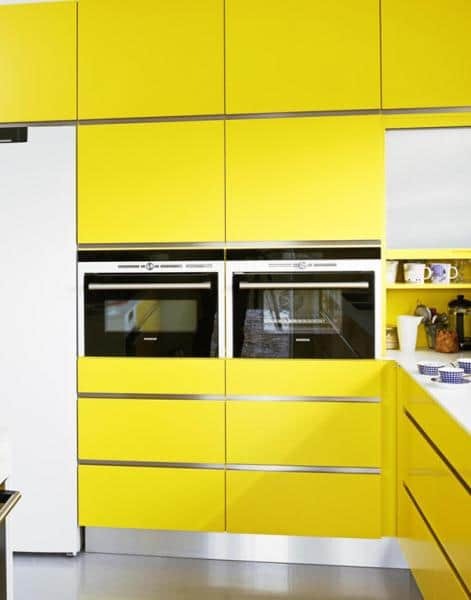 Modern-style kitchens are distinguished by the presence of a wavy line that goes from one element of the interior to another, for example from metallic fittings onto shiny cabinet surfaces. 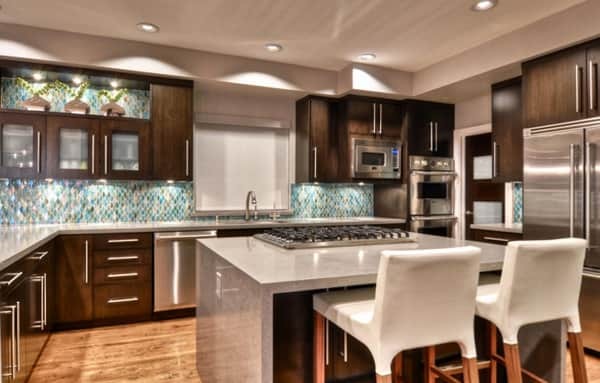 When creating a “modern” kitchen, it is important to avoid excessive pomp and pretentiousness of interior elements. 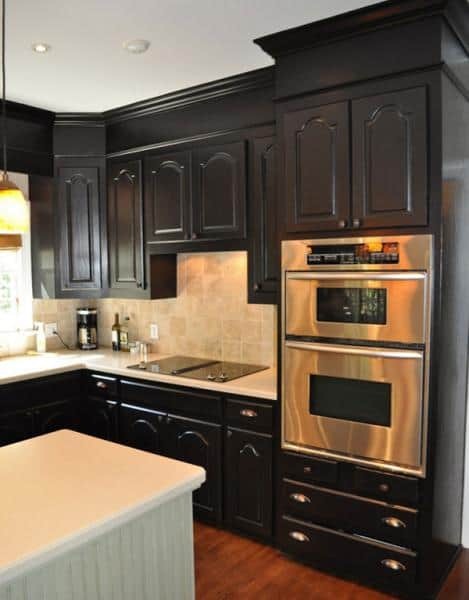 Instead, all the details should be extremely simple and concise. 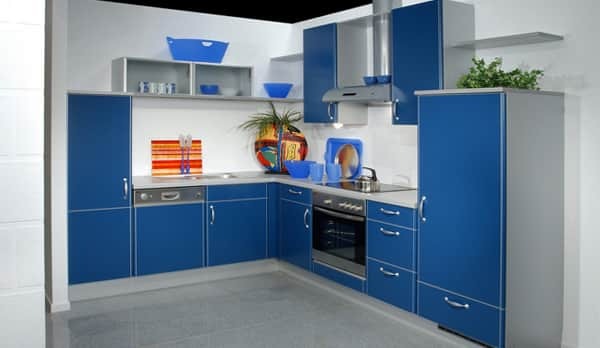 The main rule in the decoration of modern style corner kitchen sets is that the set should have a uniform style and color, from the covering of kitchen walls to the ceiling. 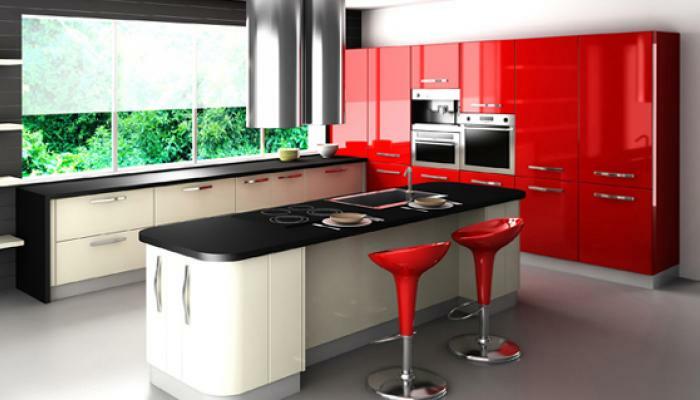 A modern style corner kitchen is best fitted with modern furniture. 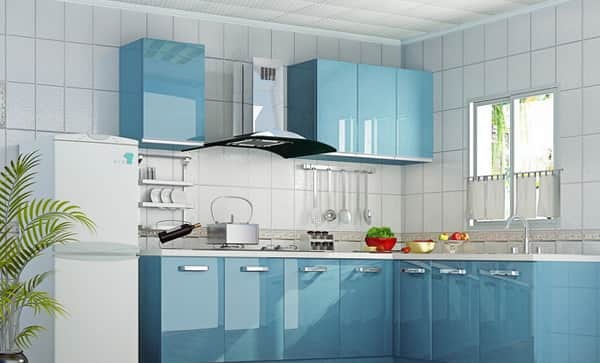 NB: Because of the peculiarities of the angular design, you can free up a lot of kitchen space. 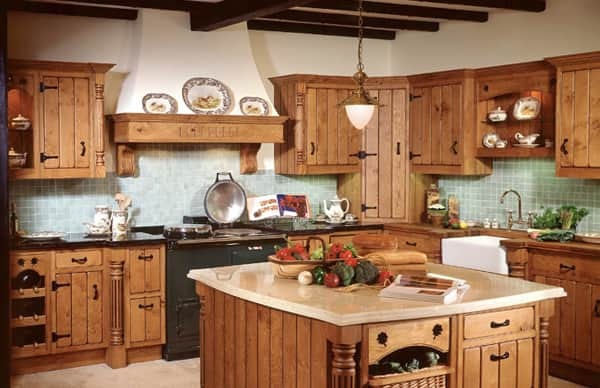 Use of the Provence style in small kitchens, although an old idea, retains its popularity even today. 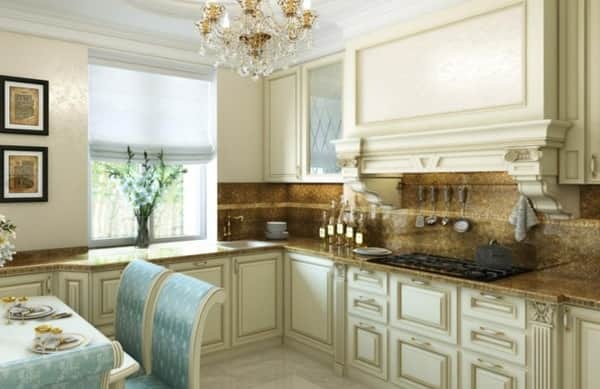 The presence of calm colors (shades from pistachio to light beige). 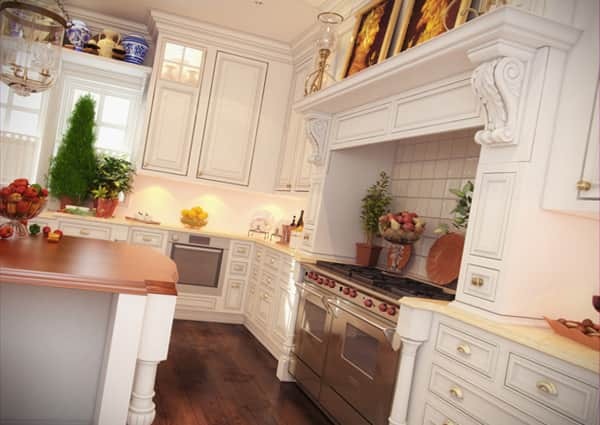 The presence of floral ornaments. 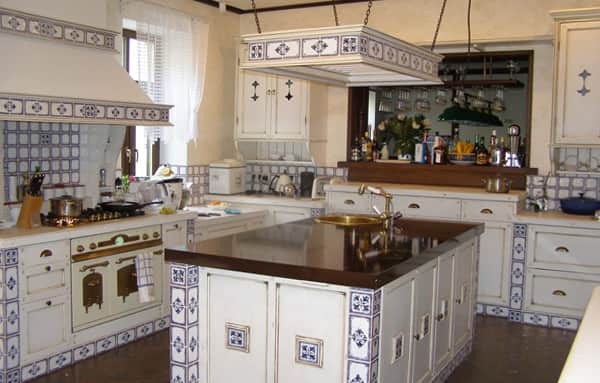 The effect of aging of kitchen furniture (cracking technique). 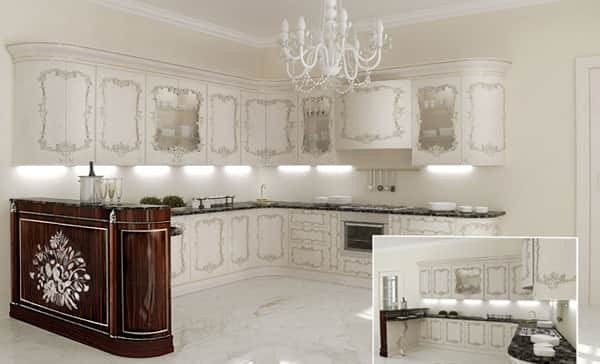 When selecting furniture for this style, keep in mind that in the French style, furniture designs are sleek and elegant. 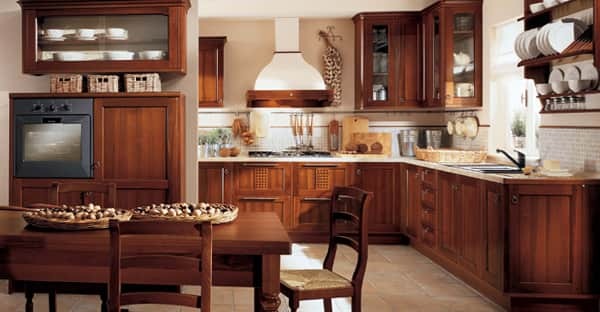 For this reason, the furniture is often made from natural materials (oak, alder, walnut), while table tops are traditionally made of stone. 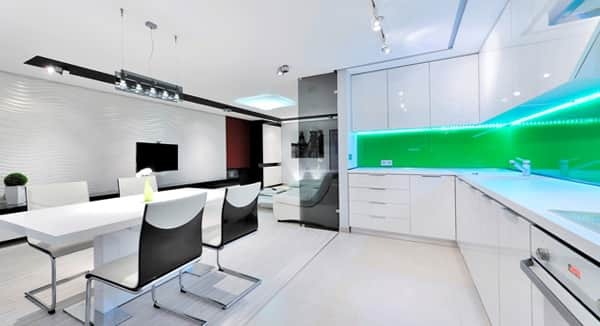 How to Create Hi-tech Style in a Standard Kitchen? 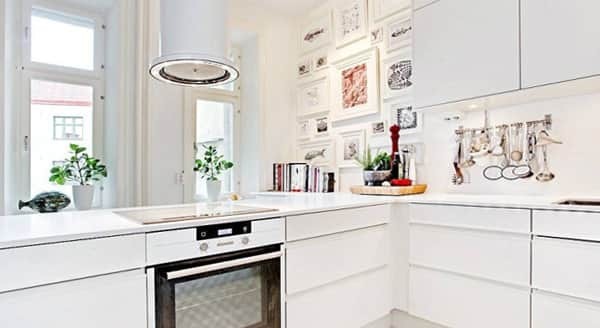 Using white as a dominant color in the decoration of the kitchen applies to several styles such as: high-tech, shabby-chic, Provence or Scandinavian style. 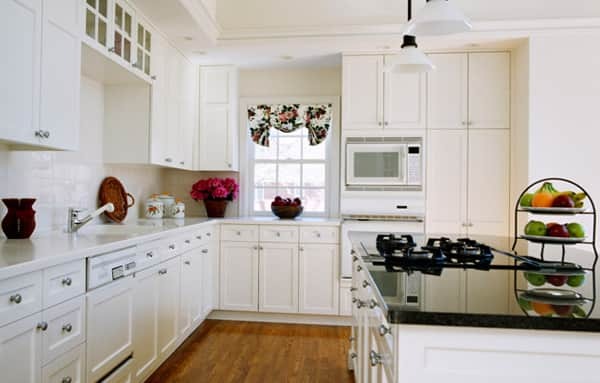 All of these styles look harmonious in white. 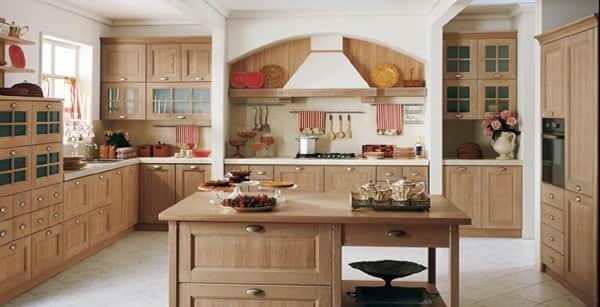 To achieve an even better look, use open shelves instead of open cabinets. 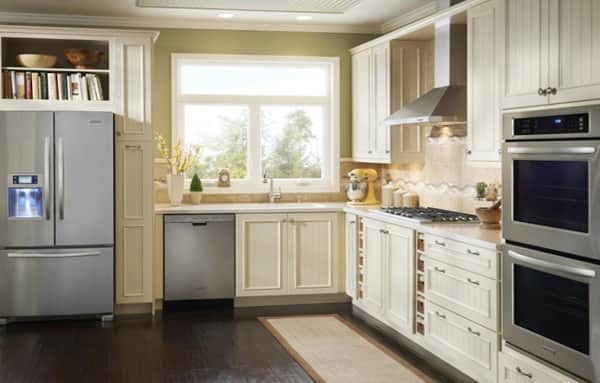 However, cabinets with glass doors are also perfect for white kitchens, especially if they hold beautiful dishes. 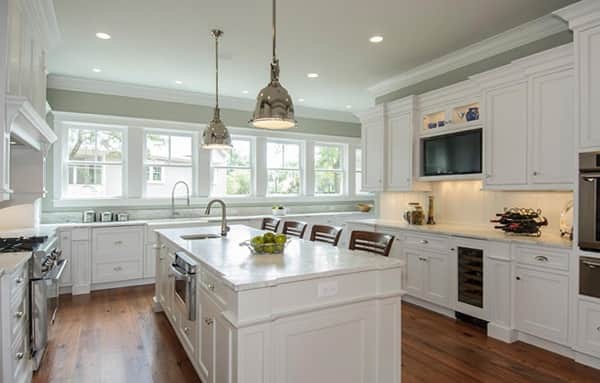 Using white in a corner kitchen visually increases the space, and through the use of built-in appliances and numerous white cabinets, you free up even more space, allowing you to accommodate a bar counter or huge family dining table. 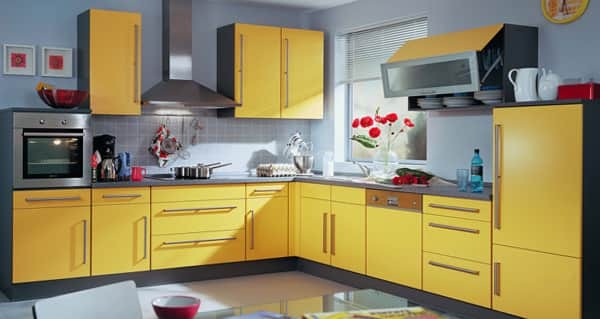 Yellow kitchen decor suits almost every modern kitchen, as long as the yellow is used sparingly. 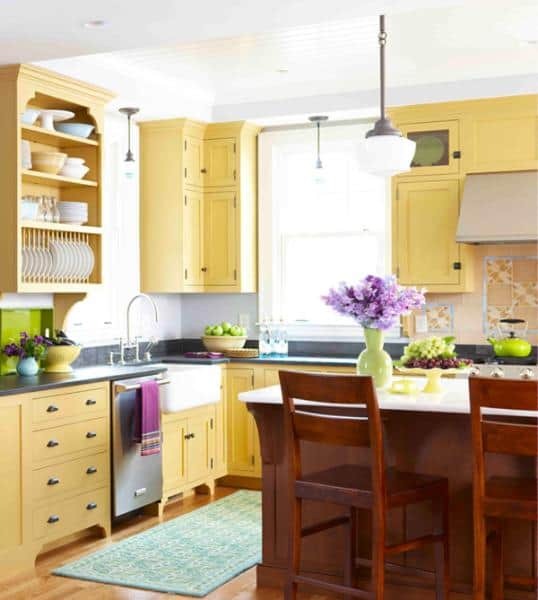 A lemon-yellow modern corner kitchen goes well with a silver-colored sink, while yellow corner sofas look harmonious when paired with a wooden dining table. 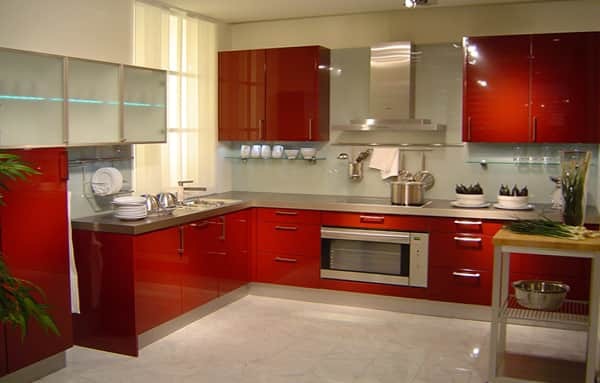 With the proper combination of red with neutral colors, you can create a spectacular kitchen design . 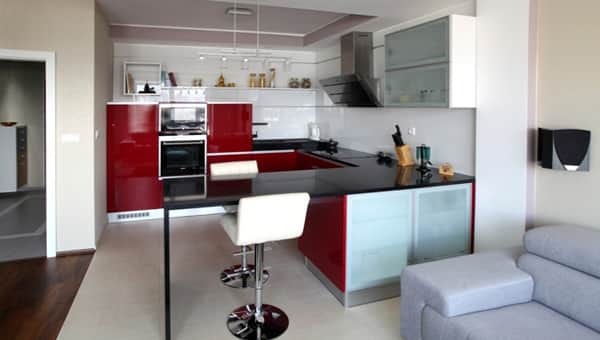 However, bear in mind that the smaller the area of ​​the room, the lesser the need to apply red in the interior. 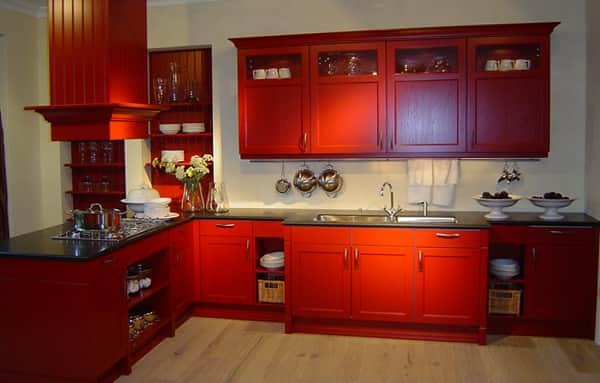 Otherwise, the excessive red will only narrow down the space. 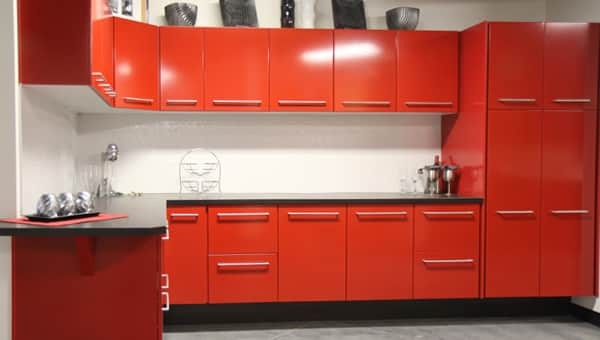 Red corner kitchens should either have red walls or a red headset surface, but never fully monochrome kitchens. 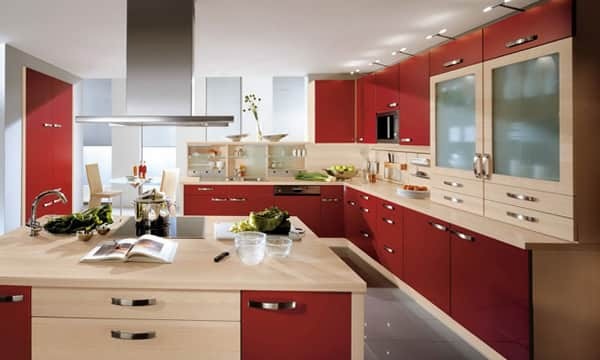 Do not forget that red is the color of vital energy and passion and therefore, it has the ability to improve the appetite and cheer up diners. 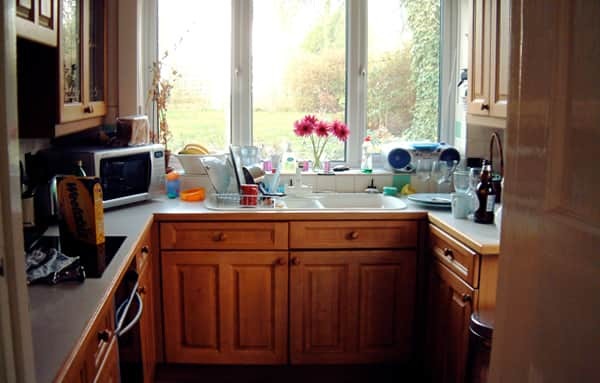 However, when used excessively, it tends to have the opposite effect, draining the energy of the occupants. 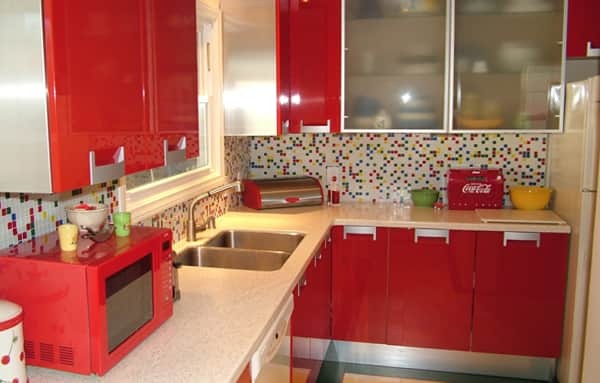 If the windows of the corner kitchen overlook the sunny side, then avoid red. 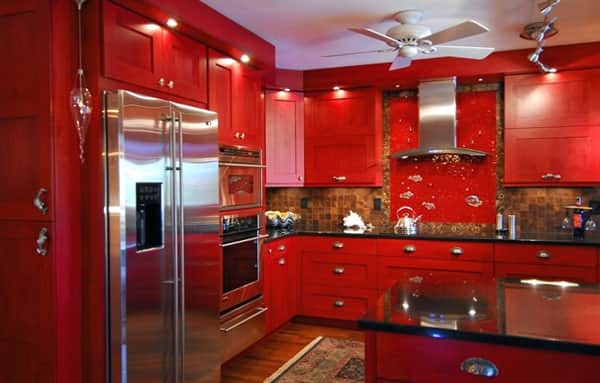 For such kitchens, using red will only lead to more heat during the summer. 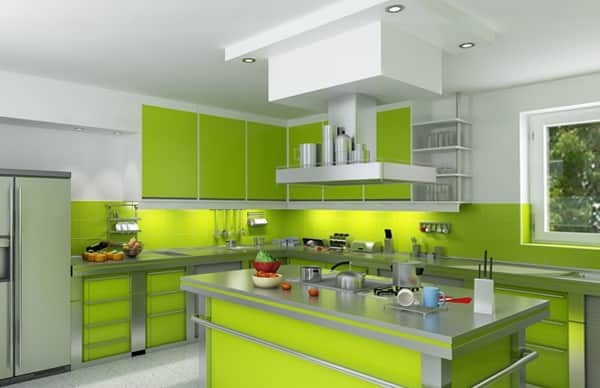 Green is the most favorable color to the human nervous system, granting it peace and tranquility, while helping alleviate anxiety and irritation. 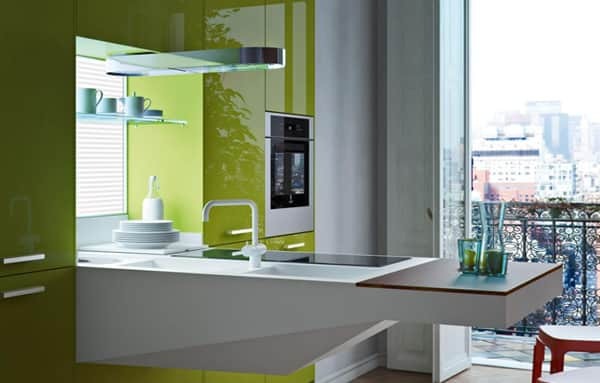 It should be taken into account that the richer the green color is, the more it fits the hi-tech style. 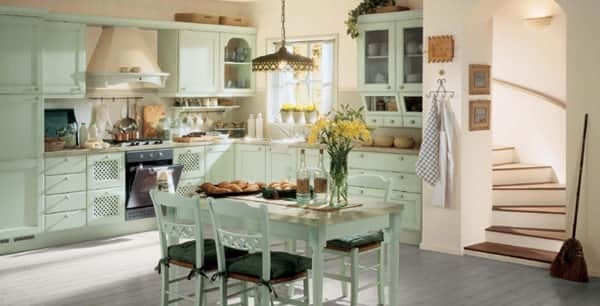 Colder and darker shades of green bring the kitchen design closer to the classic style. 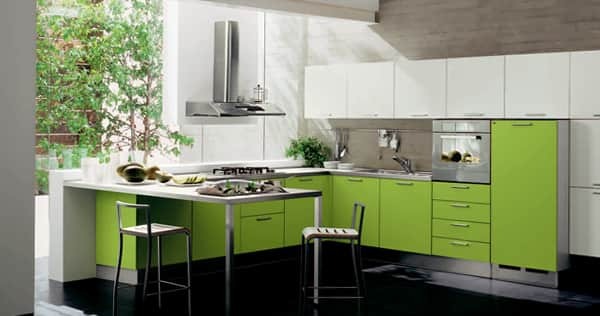 Designers recommend “diluting” green with contrasting colors like white, brown, black or beige. 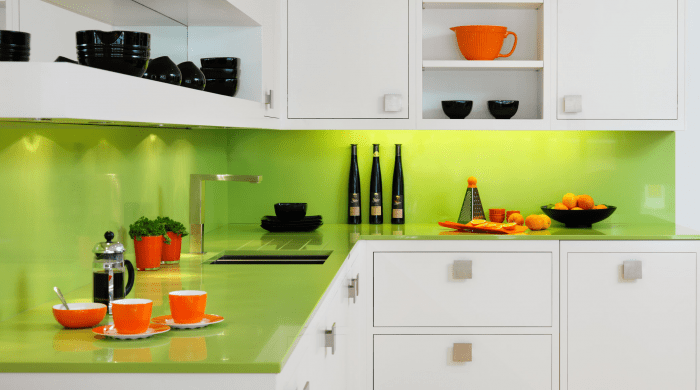 The main idea is to use green with caution, otherwise you achieve the opposite of the desired effect, creating a depressing vibe. 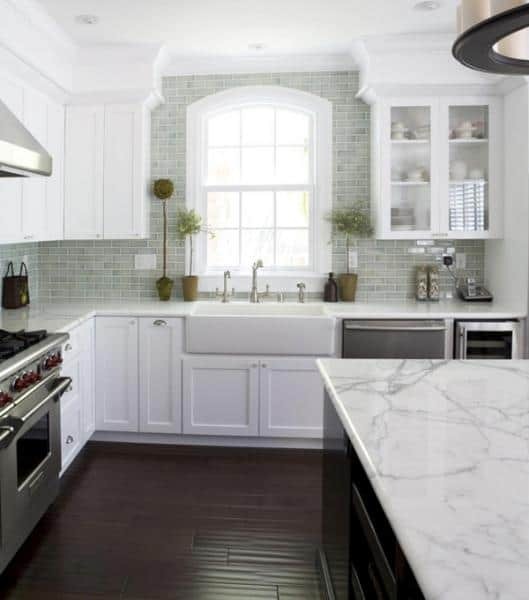 A corner kitchen with a blue color scheme has the best appearance if it’s in the following design styles: empire, marine style or Provence. 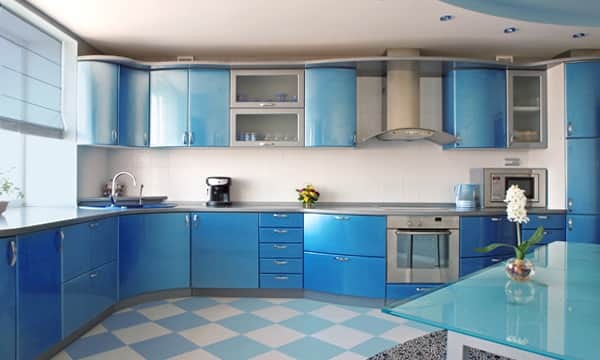 Kitchen furniture in various shades of blue can have a positive effect on the overall health of the occupants, reducing nervous tension and even relieving headaches. 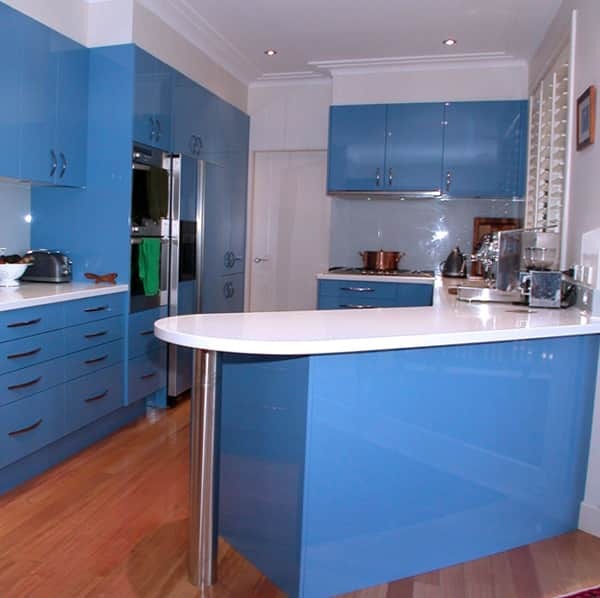 On a hot summer day, a blue hued kitchen will give the feeling of coolness, and, with properly selected lighting, even in a winter evening, a blue kitchen offers a feeling of comfort and warmth. 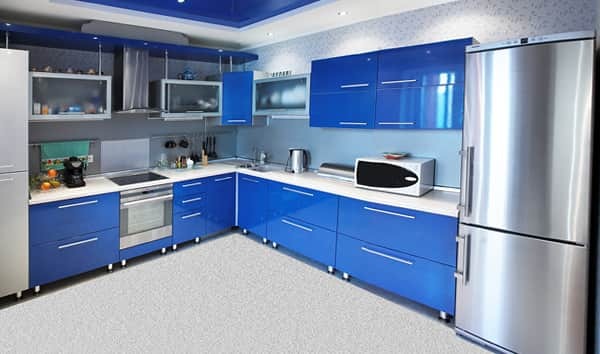 However, don’t use blue for corner kitchens whose windows face the northern side because with such an arrangement, the room will come off as cold and gloomy. 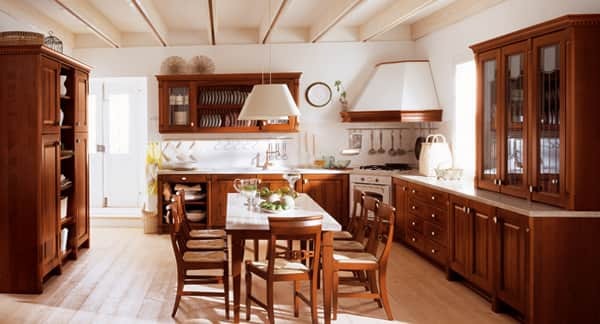 Corner kitchen furniture, in combination with a bar counter, can seamlessly offer a distinction between the kitchen’s working and recreational area. 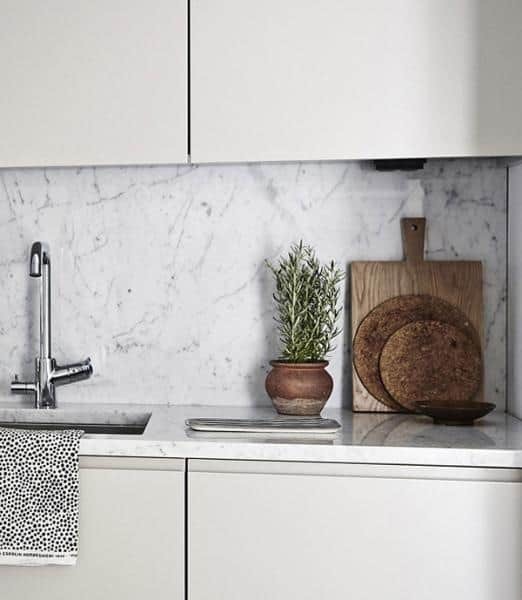 In small corner kitchens, a mini bar counter replaces not just the island but also dining table, saving space and creating harmony. 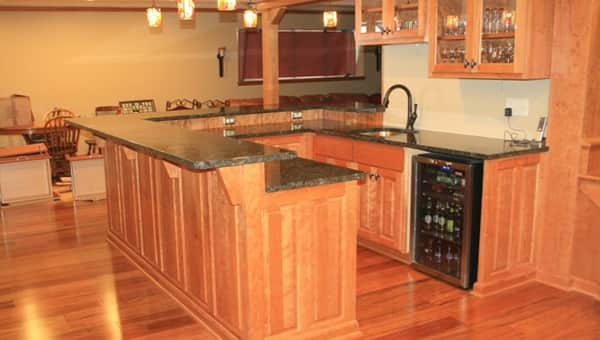 The bar counter can be a continuation of the corner headset, or a stand-alone structure. 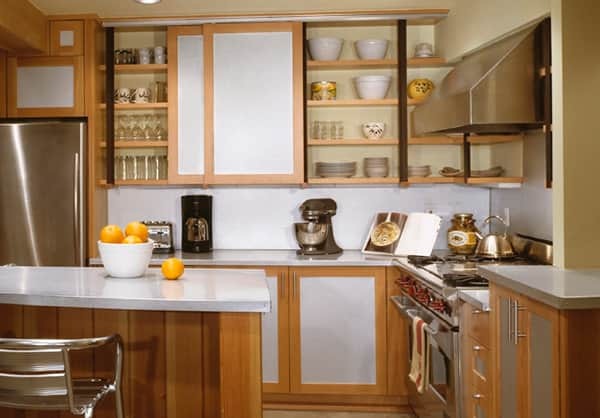 There also exist kitchen cabinets with sliding tops and folding tables that can be fastened to the wall when the need for a table arises. 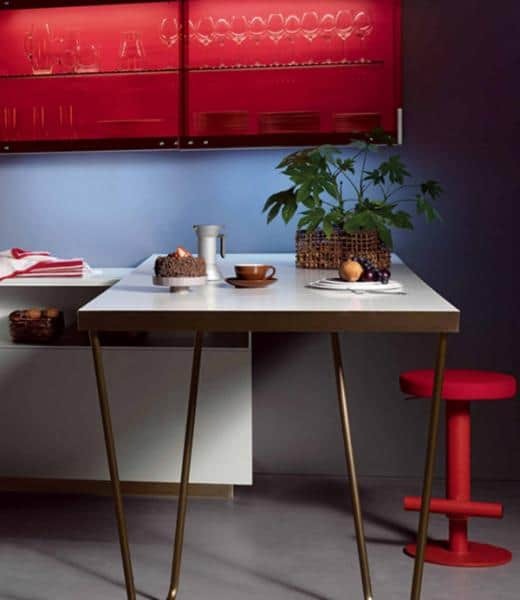 For sitting at the bar counter, you can use bar stool. 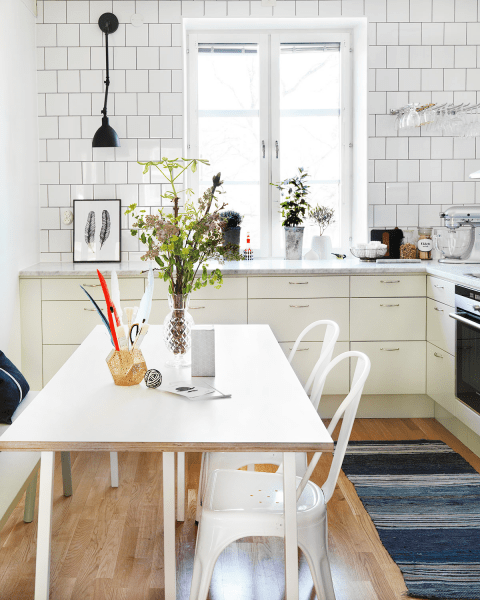 There is a wide selection of these stools from furniture retailers like IKEA. 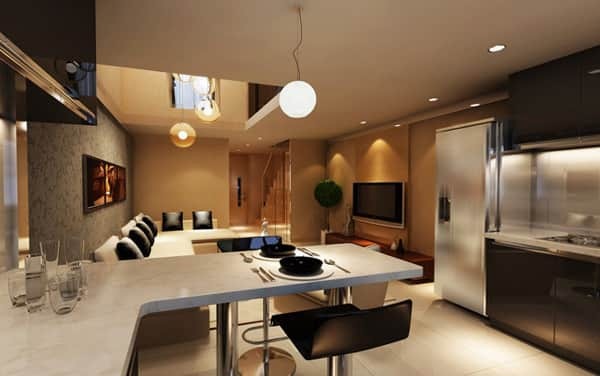 For a kitchen which is combined with the living room, the angular version of the headset is the most optimal. 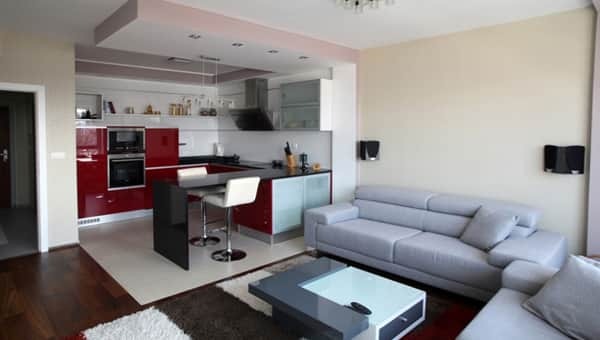 However, the furniture choices should be practical and placed in an aesthetically competent way. 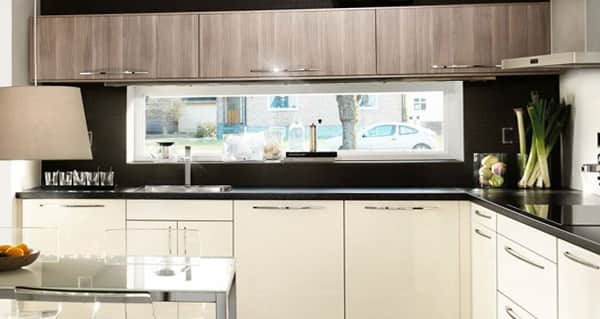 Another rule to note when designing a living room-kitchen is that it is not recommended to place the sink near a window. 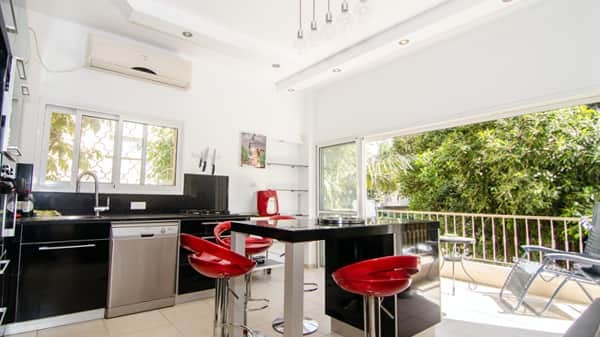 Also note that a living room-kitchen looks best with a bar, which helps create the separation between the working and recreation area. 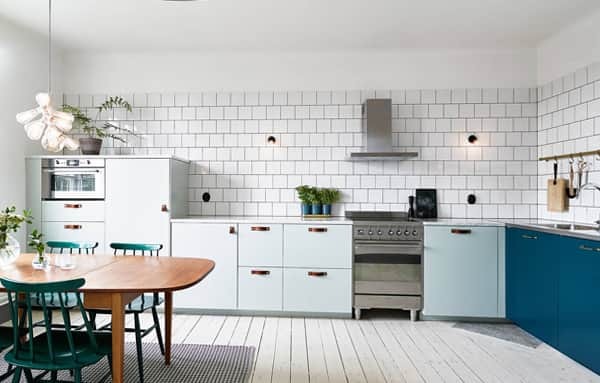 It goes without saying that when choosing furniture for a small kitchen, consideration should only be given to pieces that save space. 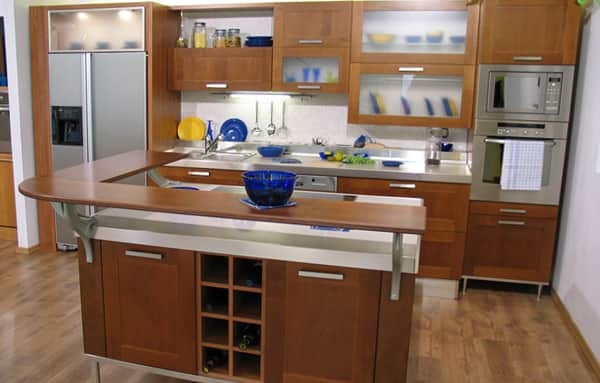 Modern furniture sets are made from a variety of materials: wood, plastic, chipboard and fiberboard. 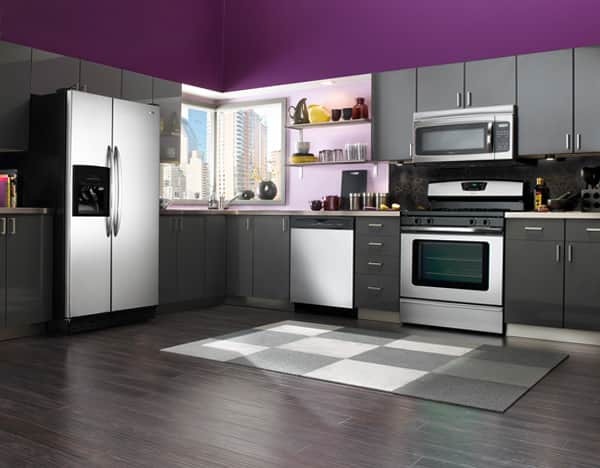 Therefore, buyers can easily find pieces that fit their price range. 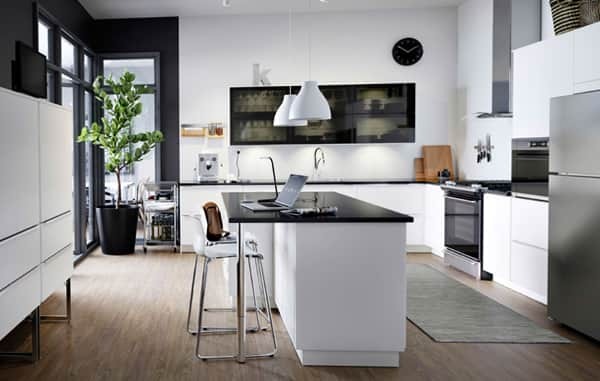 Additionally, furniture manufacturing companies offer multiple variations of finished products, making it possible for buyers on a budget to find decent and suitable pieces. 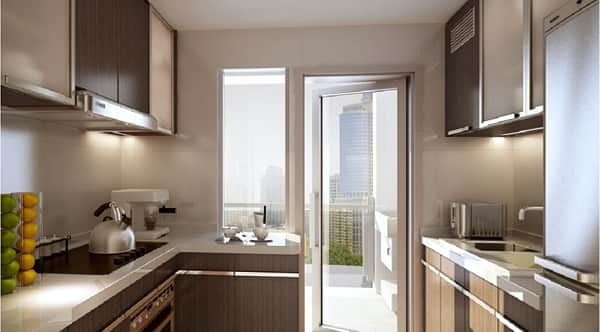 If you are lucky, you may get a house or apartment with a kitchen that comes with a balcony. 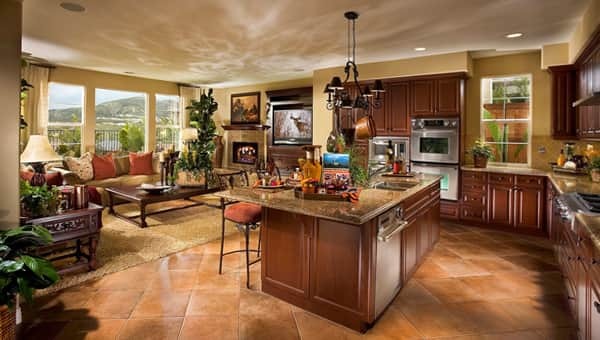 The best way to use the entire area would be combining the loggia with the kitchen. However, for old buildings, this tactic will most likely fail to work efficiently. 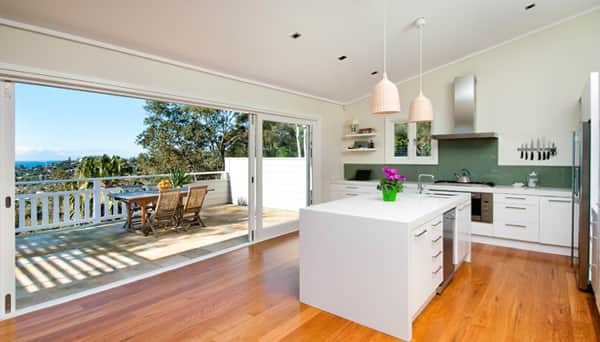 In modern homes, owners often clean the balcony unit, warm the loggia and arrange the dining area on the balcony. 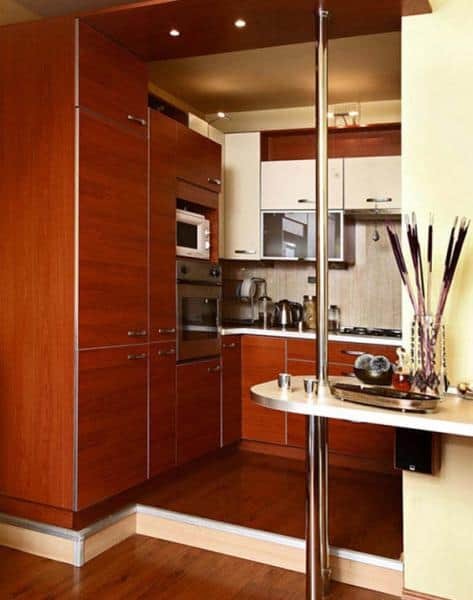 For narrow kitchens with a balcony, it is better to combine the two spaces, especially if they are of the same style. 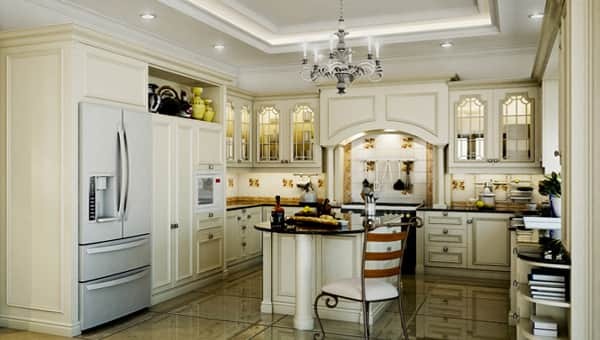 You can also improve the visual appearance and save more space by using embedded appliances. 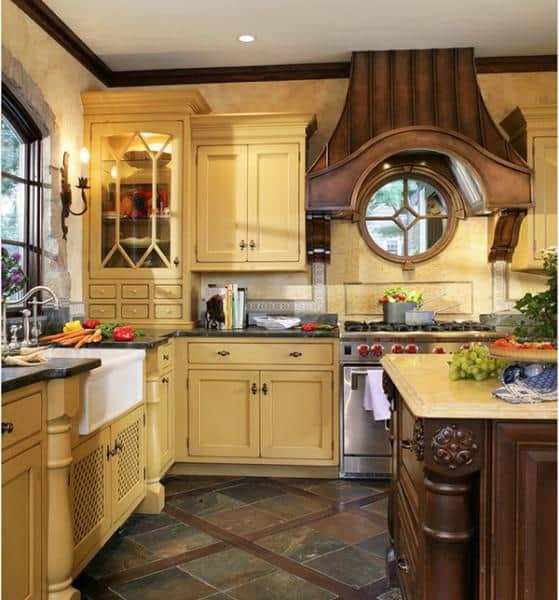 A round or oval-shaped kitchen set works perfectly with an angular kitchen set. 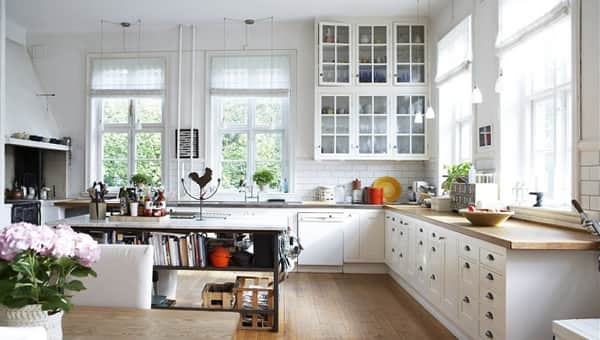 If the cabinets and shelves have rectangle-like shapes, then the square or rectangular shape of the table is the best addition in the kitchen. 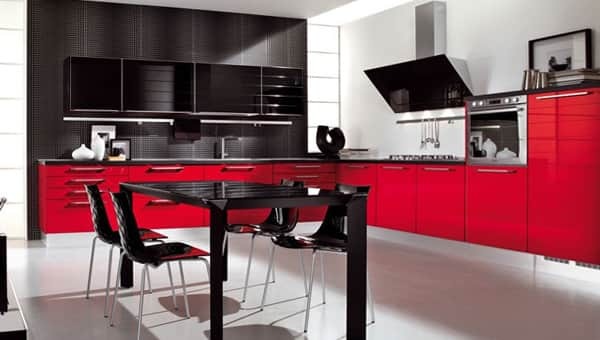 When choosing a table, you should also consider the color and the material from which it is made. 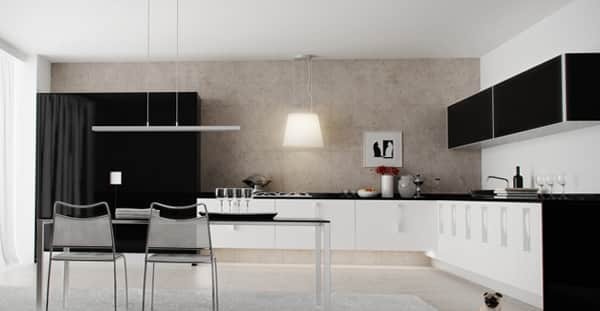 In order to achieve a harmonious combination in the interior, when choosing a table, it is best to adhere to the style of the rest of the room. 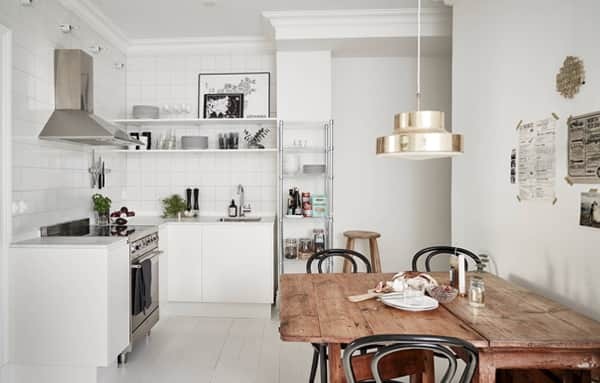 For example, in comparing corner tables in a high-tech style, a dining table with a glass tabletop, and for furniture in vintage style it is better to use a table made of metal. 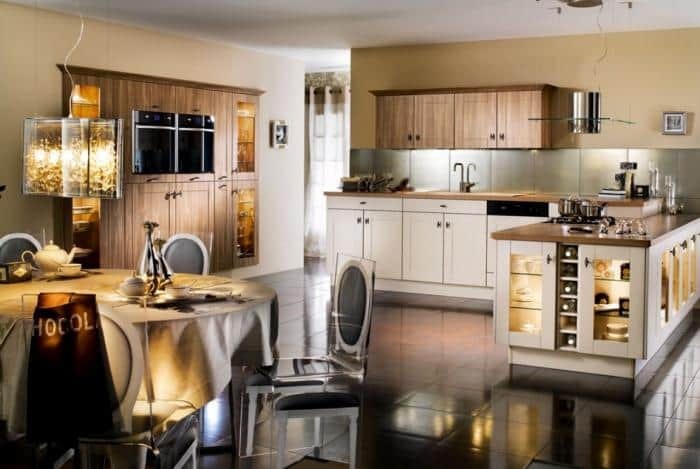 Ready-Made Furniture or to Order: Which Choice is Better? 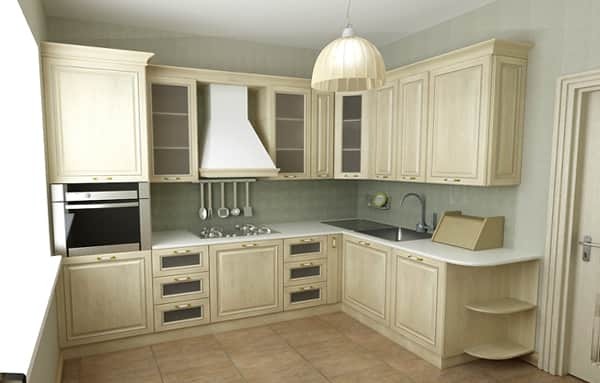 If your kitchen is of standard size, you are free to purchase either a ready-made corner set or a custom-made one. 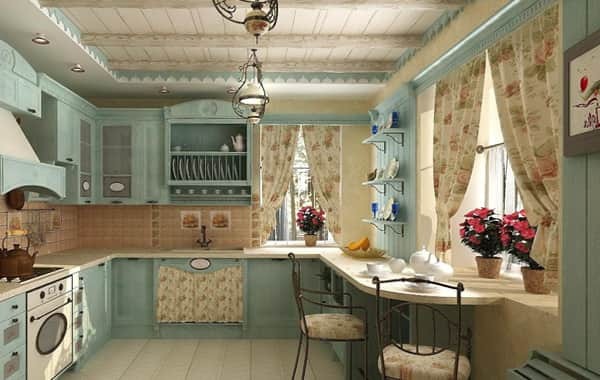 When arranging a cottage, country house, studio apartment or a small kitchen in a Khrushchev house, you should think about making furniture to order. 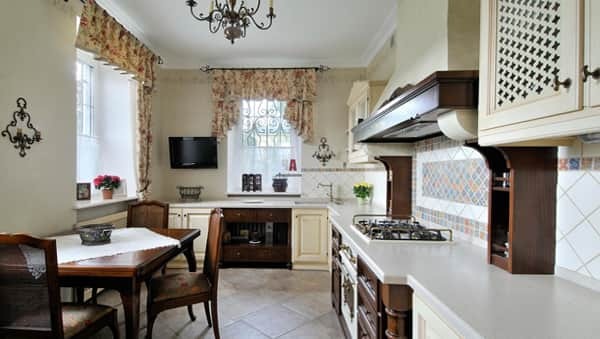 Particular attention should be paid to the kitchen in a country house with a second floor. 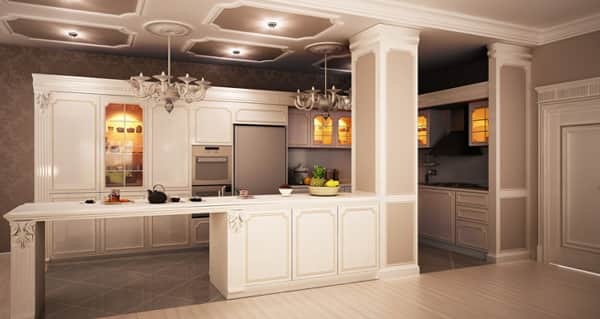 With this option, you should put all the kitchen furniture under the stairs, and put the dining table in the center of the room. 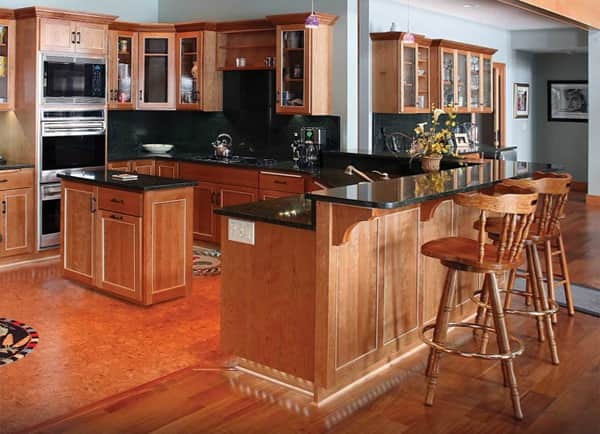 Finding the most suitable sizeable furniture can be quite problematic, so it is best to make custom-made headsets. 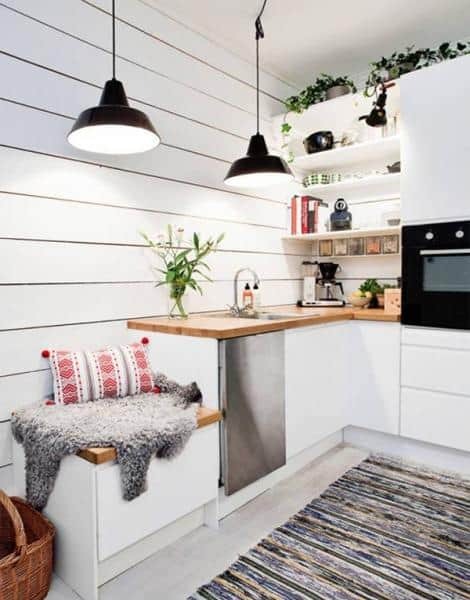 A small closet under the stairs is a practical and convenient solution for a small kitchen.